I've been building models for 40 odd years--cars since 1966. 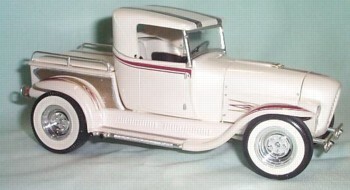 I opened my own hobby shop 5 yrs ago and specialize in plastic cars, trucks and some aircraft. See me at www.scaleautomobilia.com.au .....enough of the advertising! I built an ALA Kart model as a kid in the 60's and was talking to Paul Dion on the Model Car List about the ALA Kart. A few weeks later an old semi-built ALA Kart arrived in the mail courtesy of Paul in Florida. After joining up with fellow MCL member Bruce Cloninger in the GAKBU 2000 (Great ALA Kart Build Up 2000) I obtained a set of "Fred Cady" ALA kart decals from MCL member Jeff Whitaker in Alabama. Fellow MCL member Alan Barton in Perth, Western Australia assisted greatly with extensive info on the ALA Kart including listing on most parts and their correct colours, also with the supply of a photoetched Barris Kustoms script for the ALA Kart cowl. 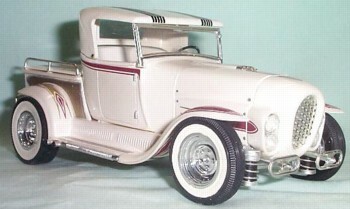 The last AMT reissue of the 29 A Ford Roadster supplied some useful ALA Kart parts including the chromed rear end. Other features are a scratchbuilt radiator, wire wrapped air bag suspension (front and rear), scratchbuilt front timing cover and front panhard rod. Paint is Tamiya Pearl White rattle can, with Boyds Clear airbrushed. 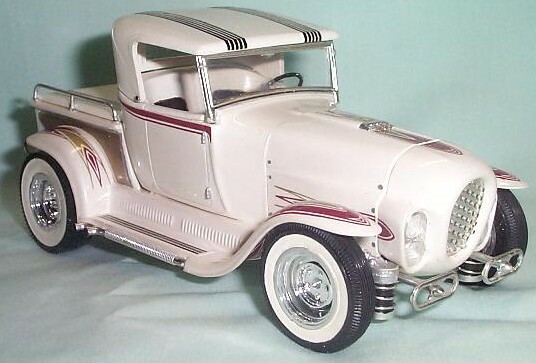 The chrome wheels are from the AMT reissued Parts Pack with "parts box" AMT front and rear tires painted with a 50:50 mix of Humbrol gloss and matte white enamel brushed onto the tires to provide the whitewalls. Normal pins were used to provide the "chromed" bolt heads at the bottom of the padded roof.....anyway that's about it.